Millions of visitors pass through Miami, FL each year. Many find themselves on layovers between flights, in the Magic City for a brief business meeting, or passing through on their way to a cruise vacation. There is so much to take in, but also plenty to do within close proximity to the Miami International Airport, Port of Miami and the Downtown Financial District that visitors will find endless ways to sample South Florida’s most famous destination, even with just a few hours on their hands. Of course, if you’ve only got one day in Miami you’ll also want to ensure fast-tracking to the best sights, experiences, culinary delights, and shopping. Make sure to bookmark this page, or print it as your guide. Getting around Miami by bus and train is relatively easy, enabling visitors to quickly navigate to the best sights affordably. Miami Duck Tours offer dynamic sightseeing tours by land and water for those looking to put their cameras to work. Bayside Marketplace offers relaxed shopping, dining, and entertainment all in one place. Miami’s Seaquarium is a top choice for families and kids, with exciting shows that even top those put on by Sea World in Orlando. 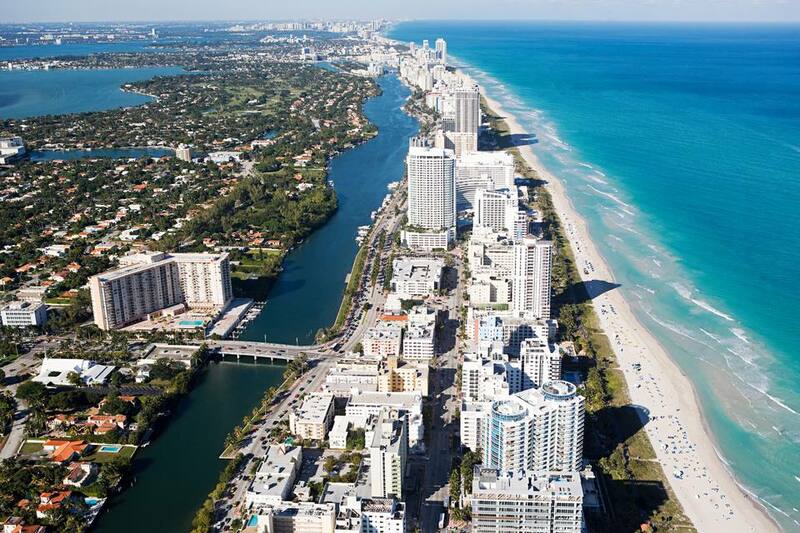 A stroll along South Beach is a must for all first timers. While for the more adventurous heading out to the Everglades to experience alligators up close and personal and enjoying an airboat ride that will blow your hair back should definitely be on the list of top things to do in Miami. Love the water, but not the sand? Take a relaxing dip in the Venetian Pool, and explore its grottos. For those that simply can’t tear themselves away from their laptops, or are in a work crunch there are plenty of inspiring places to get connected. The Miami International Airport has typically charged for internet access. However, there is a small business center, with printers for those without the time to venture out into the city. Burro and Miami Shared offer exciting co-working office spaces with great views for those wanting to tap into the local business and startup scene while they get work done. Most hotels offer complimentary Wi-Fi, though some do charge an additional access fee. For those with their own hotspots, nothing beats working out of South Beach’s lineup of cafes and ocean front restaurants. Eating sushi at the airport might not be the best choice. Plus there are endless cuisine options to choose from in Miami, no matter what type of budget you are on. South Beach offers an entire strip of eateries from staples like TGI Fridays to dramatic seafood restaurants, and inexpensive breakfasts for the health conscious. Nikki Beach offers a spectacular Sunday brunch buffet, complete with poolside cabanas to the backdrop of some of the world’s best DJs. For those passing through Fort Lauderdale, the Chima Brazilian Steakhouse is a worthy mecca for any foodie. Chima delivers an all you can eat salad buffet, with endless meat, and decadent desserts. Expect to spend at least $50 to $100 per person for the experience. Many millions of visitors from all over the globe jet into Miami, Florida just for the shopping. Lincoln Road is one of the most well-known streets for this. The Wynwood Art District offers a booming shopping destination with an incredible line up of top brand name designers. It is a must for anyone passionate about interior design and art. Serious shoppers will find the expansive Dolphin Mall offers an entire day of entertainment, with hundreds of stores, legendary restaurants including The Cheesecake Factory, a movie theater, and game arcade at Dave and Busters. Travelers spending the night in Miami will find a wide variety of accommodations to choose from. High competition among hotels means there are frequently spectacular deals to be found on everything from local hostels such as Jazz, as well as South Beach hotels, private apartments at Brickell and the Financial District, and hotels with airport shuttle services as far out as Doral and Hialeah. However, do note that during special events like Art Basel, the Boat Show, Fashion Week and the Winter Music Conference it can be challenging to find a room. The Miami airport is well policed and trafficked at night, but be prepared to battle for the best seats, and stretches of the floor.